Cabbage Mezhukkupuratti is a simple dish with hardly any spices. Mezhukkupuratti is a typical Palakkad Brahmin or Kerala type stir fry curry which is prepared by steaming the vegetables and then stir fried in coconut oil. So today, i thought why not try it by myself. And it came out really well and tasted just like the way my mom prepares it. I simply love this curry with rice and ghee (Neychoru – as they say it in Kerala and my personal favorite) and i also like it with sambar rice or curd rice. It could be also had as a dry curry for Chapati or roti. Remove the outer leaves, wash and slice the cabbage and keep aside. In a large pan, put the sliced cabbage, sprinkle a little water and add salt. Allow it to cook in a low flame. Heat oil in a kadai, add mustard seeds. Once it splutters, add green chillies, ginger and stir fry. Add the cooked cabbage, turmeric powder and mix well. Let it cook in a medium flame, so that the water in the cabbage gets evaporated. Now add the curry leaves and mix well.Remove from flame. 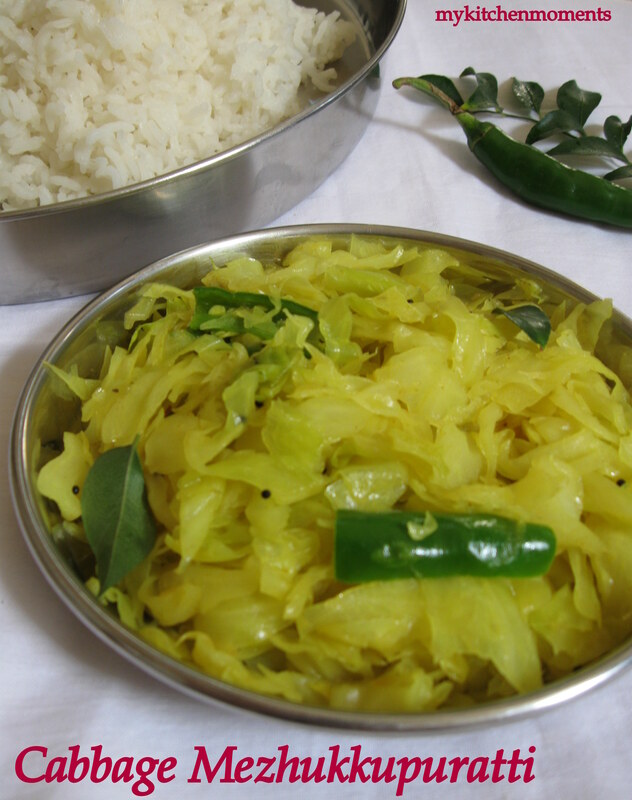 You can add grated coconut to the cabbage just before adding curry leaves. It enhances the flavor. See to it that the cabbage gets stir fried and not charred at the bottom of the kadai. You can also add chopped onions as well to make the cabbage mezhukkupuratti. But Brahmins refrain from adding onions to every dish.